My personal experience with the world of exotica came at a very tender age. The Polynesian craze which was popular in the late 50’s and early 60’s touched even my small Texas city. The Tiki Club at the Tradewinds Motel provided adults with an escape from the pressures of everyday suburban life. The Tiki Club was part of the motel restaurant and had a very foreboding and dark entrance. As a young child I wondered exactly what kind of mysterious and wonderful club the adults had devised “in there”. I knew it had to be really cool because they were given little plastic animals to put on the sides of their drinks. Many of my intrusions into the alcohol laced adult world of the time were based on the aquisition of these colorful little animals. Not only was the Tiki Club one of my targets, I was even run out of the Officer’s Club at Kirtland AFB as well! Well, I just had to have a red plastic monkey or an orange giraffe, so I decided to venture into this forbidden zone. Much like a spelunker I cautiously marched into the dark cavernous entranceway into the Tiki Club. After just a few feet inside I suddenly came face to face with a huge carved tiki god with menacing ruby eyes that reflected the dim light. Needless to say, I froze in terror! After a brief staredown with this wooden sentinel, I decided to beat a hasty retreat back into the restaurant only to hear the roar of laughter by the adults seated there. This club wasn’t in any danger of being invaded by kids on this day! The tiki totem had done its duty, the gods were appeased, and life went on. I still say kids these days have missed out on a lot when it comes to experiencing classic American cuisine. Oh OK…I’m talking about fast food. But, there is a distinct difference in what you get in the drive-thru today, and the offerings of the vintage mom and pop burger joints and small regional chains of the past. Although we didn’t think about it in these terms back then, I would speculate that the development of retro fast food was determined more in the kitchen than in the boardroom. Think about it. One of the most memorable places was Griff’s Burger Bar. These hamburgers are probably the only reason why many people today are alive! At a dime a pop, they could feed an entire family with change left over to buy fries and a shake. Griff’s Burger Bar, and other regional chains like it, thrived before the age of the behemoth fast food restaurant corporations that we see today. Griff’s back then was housed in an A-frame type structure with a boxed in dining room at the front. As a small child I tried and tried to scale the sides of the A-frame but 2-3 feet was all I could manage before sliding down. The good news is that Griff’s is still around! While not any serious threat to the McDonald’s of the world, Griff’s still puts out burgers and fries that tastes like the real deal instead of the product of zealous corporate consistentency. If an occasion warranted a really special fast food treat, we would go to Ozark Fried Chicken. Long gone, this small chain sported green and white striped rooftops on their restaurants which predated the famaliar red and white pattern used by Kentucky Fried Chicken. The branding for this place was probably not too successful since it incorporated a logo of a woman wearing and old-style bonnet…not too groovy for the swinging 60’s! 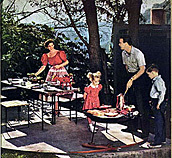 In the decades following World War II, the population of the United States underwent a massive migration to the suburbs. The society which became the “Patio Culture” of the 1950’s and 1960’s has been the subject of much criticism from intellectuals and social scientists both then and now. Much of the criticism can be attributed to the mind set of the critics themselves, which could be considered apathetic to the conditions of the middle class. While many of the social problems that the critics so poignantly singled out did, in fact, exist, they often did not manifest themselves to the extent that was claimed, and they were also simultaneously taking place outside of suburbia as well.